a small country with excellent gorilla trails. area, are fast becoming a threatened species. A visit with them is a thrill in itself and adds an exciting dimension to an East African safari. Day 1 — Arrive Entebbe this morning where you will be met and taken for an early lunch. You will drive to Mbarara passing through papyrus swamps close to Lake Victoria and tracts of rain forest and the rolling plains of Ankole cattle country. Mbarara is a colorful and friendly market town. Day 2 — Drive into the ‘Switzerland of East Africa’ passing through areas of breathtaking scenery, high hills and low valleys. Arrive a Bwindi Impenetrable Forest National Park, famous for gorilla trekking and now a World Heritage Site. Day 3 — Early departure for a day of gorilla tracking in the forest. The guides will lead you through the high altitude rainforest abundant in endemic plants such as orchids, bamboo, etc. The length of time needed to located the gorillas varies greatly - anywhere from 15 minutes to 4 hours. It may be VERY taxing, and should be undertaken only if you are completely fit. After finding the gorillas, you will spend an hour observing and photographing these fascinating animals. 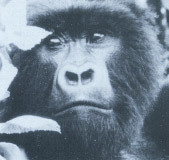 You may be rewarded with fine views of gorillas feeding, grooming each other, socializing and perhaps climbing trees. You are sure to be awed by these huge, gentle creatures. Day 4 — A second day available for gorilla tracking. Day 5 — Depart for Mbara where you will stop for the night. Day 6 — Today drive to Entebbe, If time permits it is possible to stop in Kampala for shopping, the Mpigi Royal Drum Makers before heading to the airport for your next adventure. The long drives can be reduced or eliminated by using charter flights partially or entirely on the Uganda itineraries. These can be quoted on separately. UGANDA has much more to offer than just the gorilla tracking. Take time to further explore this beautiful and fascinating country by including Queen Elizabeth National Park with its variety and scenic beauty, Chambura Gorge to view the chimpanzees, Murchison Falls, Lake Mburo National Park, Lake Bunyoni and much more. Ask us about itineraries with these exciting additions. For those who may not have the time, you will be delighted to know that Rwanda is back on the map! Day 1 — Arrive in Kigali, Rwanda’s capital where you will be met. You will drive to Kinigi, near the Volcanoes National Park headquarters. approach safely to within a few feet. Day 3 — A second day where gorilla tracking can be undertaken. NOTE: Every effort is made to find the gorilla family when tracking, however there is no guarantee that they will be seen. Uganda and Rwanda, in the southern hemisphere, have rains from late March to the end of May, and to a lesser degree, in October and November. From October through December, the gorillas are moving toward the bamboo area, which necessitates a longer tracking period.